NOTE TO SELF: DON’T DELETE THIS, IT’S NEWER THAN THE SVN VERSION!!! NOTE TO EVERYONE ELSE: My philosophy of design has moved away from writing long abstract documents like this. I’d much rather start writing software and iterate toward a goal, rather than plan this much. If I find myself opening Word instead of Visual Studio or Photoshop, I’m probably going about it wrong. However, I’ve left it up in case you’re interested in reading some of the detailed design documents I was writing after I graduated. The Lore Repository, a Dynamic Timeline and more. There are many pieces of software that allow of the fast and quality production of timelines. However, these software products are designed around the idea that a timeline is about history, and since history is relatively static, the timelines are static as well. The problem is that during the creation process of a fictional work (video game stories, comic books, etc.) the timeline of events is constantly changing. For example, one character may be 2 years older than another character. Each character has a birthday on the timline, but the particular dates are not necessarily set. If one birthday changes to a new time on the timeline, then the other birthday event should move as well. The Lore Repository is designed to function around this alternative, dynamic approach. While drawing orderly or decorated timelines is not a priority, keeping track of relative dates is. At this point we haven’t decided whether this should be a web interface, a standard software interface or something else. As such, none of the user interactions have been defined. Generic phrases such as “detail display” and “X screen should be accessible from the current screen” are used. Particulars of implimentation must be decided later, such as double-clicking versus clicking on a link or mousing over an item to recieve a tooltip. Just use best practices for the platform that we end up going with. Feel free to ask questions in each instance. I might do UI mockups later as well. There are three measures of time in the Lore Repository. The first is a “tick”. Ticks are arbitrarily long units by which all objects are measured. The second is “User Time.” User Times are custom defined units of time, they are measured a number of ticks or a number of User Times. This allows a user to define in-character units of time. Examples could be “Stardates”, “Ages of the King” or “Years since the bomb”. Finally there are “Real Dates.” These are dates and hours which correspond to the real passage of time (More on the usage of Read Dates in the Event Fields section). These can be used to sort events by creation date, publishing date, and so on. The Lore Repository is based around the concept of an “event”. There are several types of events, but they all have the same basic functionality. Events have links to other events. Most like are bi-directional. They should be represted by a line with an arrow on each end pointing to each event. Some lines are one directional, they are specifically noted. The most basic links are “Before” and “After” links. If event A has a “Before” link to B and A moves to a time which is later then B, then both events move in tandum, B will move to the tick after A finishes, thus perserving their relative position on the timeline. After Links work in a similar manner. The next link types are “Ticks After” and “Ticks Before”, these work in the same manner as Before and After links, except they have a specific distance which must be preserved. Event A might come 500 ticks before event B. When event B moves to a new time, Event A will move 500 ticks before event B’s new tick. These link types can also specify a range. Thus event A can be 500-600 ticks before Event B. When event B moves to a new time the software adjusts event A to keep this range in tact. The sofware should move event A the minimum distance to preserve the link. If it’s possible to not move event A and still preserve the link, then that’s what happens. When a chain of links exist the software should do it’s best to adjust as far along the chain as nessesary in order to preserve the link relationships. For example, A is 5 ticks before B. B is 10-20 ticks before C. A is currently at Tick 0, B is at Tick 5 and C is at Tick 25. If A is moved to Tick -10, then B must be moved to Tick -5. Now C must be moved earlier to satisfy the 10-20 tick link, C will end up at Tick 15. If links prevent an event from moving the software informs the user of which links are preventing the event from moving and doesn’t move the event. For instance, if event B is set to Tick 100 and event A is 5 ticks before event B, and the user attempts to move event A the software will tell the user that a link from event A to event B and a defined date in event B will not allow A to be moved. Events can have “extracted” links. They do not represent a relative difference in time. Instead they indicate that a specific event was mentioned in another event. They don’t need any functionality beyond keeping track of the event which they were extracted from. Events have a Contradicted link to another event if they reference documents which contradict each other. There are two primary ways to display information in the Lore Repository. 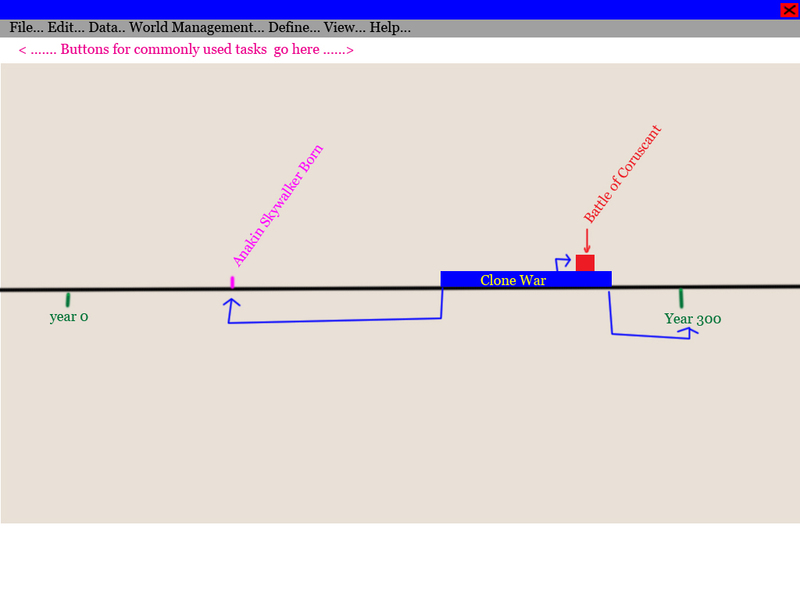 The first is similar to a traditional timeline with events represented as bars along a line. Titles and the date which the events are currently sorted by should be displayed. The timeline should probably scroll and zoom. Usability is the goal with these features. The second way to display information displays event details it should show all user-visible fields and properties of the event. Information in the Repository should be sortable by any event field that makes sense( like creation date, tick number, release date, etc). Once they are sorted they should be displayed on a timeline by sort order. Information should be filterable by any field that makes sense (such as category, event type, etc). Events which do not meet the filter are not displayed on the timeline. Event containers should be displayed differently than other events, instead of bars on the line, they should be brackets above the line. Title [Text] Should be the name of the event display window and other relevant places where an events name should be shown. Subject [Menu/Text] Functions the same as Categories. Shipped date [Real Date] Should be automatically checked during the Ship process, should ask for confirmation if the user wants to change it. Created On [Real Date] Should be automatically filled in on event creation and unchangeable by the user. Last Edit [Real Date] Functions the same as Created On, but gets updated whenever the Event is changed. Document Preview[Various] A preview of the document attached to the event, if a preview is readily available. Double clicking the preview opens the document. View Document [Button] Opens the document or content. Notes [Text Field] Just a text field to store notes. Events can have a reference to a document which records what happened during the event. A document is something like text or a picture (a comic etc), or a movie. While multiple events might be described in a single document (example: several battle events are described in the same war novel), each document has only one instance in the database. Multiple events just reference the same instance. There should be a “Document View” which lists all the documents (and optionally, all the Content as well) in the database and allows the user to open them or edit the documents properties. Out of Character [Check Box] No special functionality. Defaults to off. Categories [Menu/Text] All previously used catagories are options in a menu, as well as a “New Catagory” option, which prompts for a new Category name. Same catagory list as events. Imported On [Real Date] Should be automatically filled in when the document is imported and unchangeable by the user. Updated On [Real Date] Automatically filled in when the document is edited. Unchangable by user. *When shipping, if there is a document which has not been shipped (but is about to be) and it contradicts an already shipped document, there should be a confirmation box for each “Contradiction” which is being shipped. -Instead of referencing a document like most events, Content Events reference a specific executable on the user’s computer. For instance, a game could be launched to show an interactive cut scene, or a network utility might show the current status of a server somewhere. -Content items have an additional field for location in the other application. Just a text box. Event containers are a special kind of event which contain other events. Event containers can define a start date and an end date (in Tick/User Time), if these fields are filled in by the user, than the event container brackets from the start to the end date. Event containers can have a duration defined (in Ticks/User Time), they are the length of the duration whereever they are moved on the timeline. If start or end (and the duration) are not set, an event container begins at the begining of the first event it contains, and ends at the end of the last event it contains. When viewing the event details display for an event container a list of all events it contains should be visible. Those event’s event details display should be accessable from the list. If a date is not specifically in an event container, but it’s date is between the start and end date of the event container than it should be listed in the event container’s event details display under a list titled “Concurrent Events”. Event containers have the standard event’s reference to a document, however they also have references to “Loose Documents”. The event details display should list them and allow you to access them directly. There can be as many as the user wants. Events can be in multiple containers and event containers can be inside event containers. Story Arc’s are broad catagories of events. They do not show up on the timeline, and do not span a period of time. (For a quick example, lets consider a novel. A book begins telling the story of how Grandpa Smith aquired the family farm. It jumps ahead 50 years to 1945 when Johnny Smith lost the farm. This story arc does not span events in the skipped 50 years, nor does it contain events which happened in WWII. It does contain events around 1895 and 1945, but only specific events in those time periods.) Essentially Story Arcs are just an abstract list of references to events. A Story Arc has references to events. Terminology: These events are “in” the story arc. Story Arcs have a Title field, Created On, Shipped On, and Retired fields. (Same functionality as events). In addition Story Arcs have a boolean “Closed” flag. Defaults to open, saved when the user modifies it. The Story Arc Also saves the real date when the Arc was closed. All Story Arc’s should be accessible on a list in the software. Their details (listed above) should be accessible on a detail display. All the events and documents they contain should be listed there (and have their event details display accessible). When events in the timeline view are filtered, the events which do not match the filters should not show up. Filters must provide additive functionality (which means, if multiple filters are defined, entries are included if they match one or more filters), however, subtractive functionality would be nice, but low priority. It would also be nice if a text search was available. Events would match the text search filter if the search for text was found in the title, catagory, subject or notes fields. * Unlocked [Bool] Defaults to true, specific functionality to be provided at a later date. *Date Unlocked [Real Date] The date which this item became unlocked. *Additional Notes [Text] Arbitrary text saved between sessions. A color would be defined per Story Arc. When an event is in a Story Arc, it inherits the color of the Story Arc as it’s primary color. A color (seperate from the primary and secondary color) would be defined for each event container. Events in that event container would inherit their secondary color from one of their event containers. Event containers would inherit their secondary color from an event containers they are contained in. A low priority feature: The ability to split or combine ticks. The user can specify “split all ticks in half”. This will double the distance (in ticks) between all events, double the duration of all events, double the number of ticks per User Time etc. Combineing ticks would have the opposite effect. Essentially this is changing the “resolution” of the timeline. This is a low priority feature, but perhaps consider it while creating your timeline implimentation. (The above density problem might be completely avoidable with a decent design). The software must be project-agnostic. New Repositories should be able to be created without any special knowledge (it’s ok to require a familiarity with installing and basic setup required software). The software as a whole should be able to be zipped up and installed (i.e, manually copied to the appropriate directories, we don’t need a special installer program) on other machines without too much trouble. We reserve the right to distribute the software any way we choose (although we’ll mention you as the software’s original author). The software must be compatible with the GPL. If you use any 3rd party libraries they must be available to the public (for free preferably, but for pay is fine). Multiple users must be able to work on a database at the same time. This can either be through making the database diffable/mergable (for use in SVN or CVS etc) or some type of multi-user server that tracks edits in real time (like File Maker Pro or Access). TLMStart.jpg is a shot of the utility just after it’s opened up the Star Wars Story Universe file. You can see events along the timeline in the center. TLMElementSelect.jpg is when the user clicks on the Clone Wars event, and it shows all the links that this event has. (I drew the link between Battle of Corsucant and the Clone War backwards. It should be red and facing from the battle towards the war, since the battle has a DURING link to the war). TLMInfoDisplay.jpg is when the user Double-clicks the Clone War event. This dialog box comes up and displays the information stored about that event. Appendix A: This is a very old summary of the software, feel free to read it so you can get a better understanding of the direction, but don’t get caught up in contradictions, and don’t accidentally let one of these features sneak in if the feature isn’t in the design document posted above. It will be a utility to keep track of game lore, be it written content, pre-recorded sequences in the game, references in movies, letters from non-player-charecters (actors) in the game, or other. It will also keep track of various discoveries and inventions according to player actions. Which means it will have to interface with the game servers (and game client). How it does this is fairly open. The servers could just write specific triggers “Advanced Alchemy invented by Player X” to a file, and then the lore database could read that and start distributing that info to players. Then the client would have to be able to recieve basic commands from the utility (this could be something like running the program and pointing it to a specific cutscene to play. The utility would have two modes. Developer mode, where lore is authored, controlled and distributed from. And Player mode, where the lore is displayed (and unofficially distributed). The tricky bit comes follows: The game server should have access to the developer’s utility database, and will control the distrobution of individual piece of lore to the game client. The game client would then store the lore pieces in the players databases. Then the player can open the database anytime he wants, and read all the lore he’s discovered. However, you may wish to keep in mind that our server and our client would not be the only ones to use the utility. There needs to be atleast a windows utility but Linux also would be nice. Data must cross reference with other date. Must be able to display cross referenced data intelligently together. Should link to ingame replays of special events, or external movies. There are some other “features” too. Data exporting, so the developers can take their database and distribute it (ship) to players. Should include a “release” version which allows players to collect lore, both from company releases of files, and from ingame documents collected. Game client should be able to faciliate transfer of documents between players. Should include plugin support for various games, so ingame linking is more convinent. Notes should be able to be marked “Out Of Character” to convey non-lore information. Appendix B: This is an old requirements document that I wrote long before I knew anything about software design or requirements documents. Much of the information here is outdated redundant or incorrect. However, it still might help understand the thrust of the software. These are not requirements, DON’T BUILD THE SOFTWARE BASED ON ANYTHING IN THIS POST! Some terms are introduced before being defined, keep them in mind and read on for their definition in the relevant section. -Story worlds may be linked with a specific date. At this point they form a new story set. 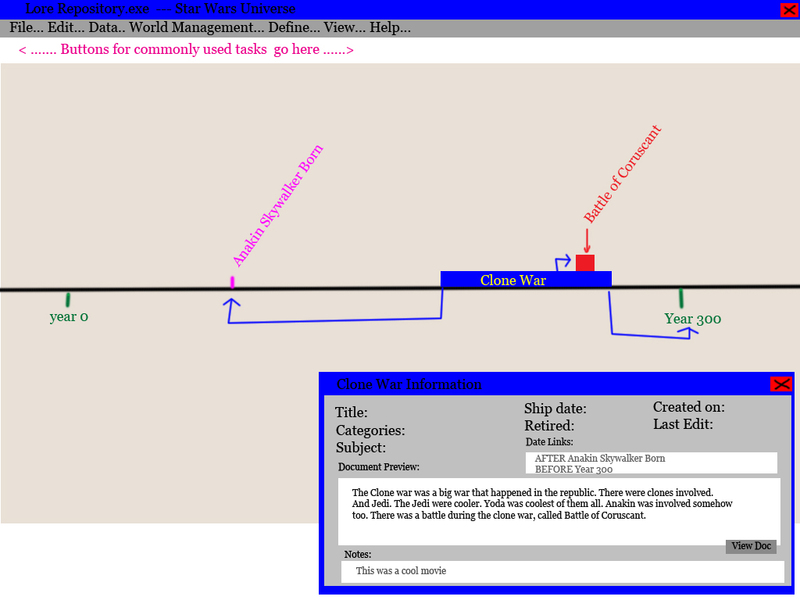 -A Storyfolder is the tenative generic name for a StoryWorld, StorySet, StoryArc, or Chapter. -Each set of World Years should have a conversion factor to universal Ticks. As such, World Year conversions are possible vicariously from one User Time set to another. -A StoryWorld is the equivelent of a game. -StorySets should have the ability to contain other StorySets in the future (I’m not sure if I want this feature or not) At this point the GUI won’t include the ability to do this. -Each arc contains atleast one Chapter. It can contain as many as the developer wants. -Arcs can contain loose documents. -Each Chapter can contain notes that are not shipped. -Chapters should have specific start and end dates, and there should not be any overlap or empty space between chapters. -Start and end dates(real time) are not set until the chapter is started (the first Content is shipped) and ended (the last content is completed). In game dates can either be set by developers, or matched to the time it takes players to complete the chapter. -Documents can be shipped before a Chapter begins (or after it ends). These documents ship dates are timelined inside the time period of the next chapter, even though they belong to the current chapter. StoryWorld colors are the border of a StoryWorld Block, StoryArc colors fill the arc, Chapter colors are contained in the Arc. Timeline view fills the workspace with a white field and a horizontal grey line. Along the line are cross marks which represent ticks. When a universe starts the ticks should be about 1 or 2 cm apart. Search displays all documents which match match the search options. Both search and filtering can be used at the same time. When a user selects New from the File Menu it starts at various points in the creation wizard. | Chapter colors relate to the arc they are in. If the arc color is blue than choices for chapter colors can be sky blue, sea blue, dark blue, navy blue, greenish blue, primary blue, pearl blue, royal blue, etc.